Andrea "Andie" Metcalf, President/CEO, offers more than 30 years of human resource management and training experience, with an emphasis in employment, compliance, training and development, and customer focused services. Andie's background includes working with and recognizing the strengths and challenges of both small and large organizations. She has held executive positions managing financial and people resources. Andie’s employment record includes experience as a management facilitator/trainer and vice president of human resources, in banking, lending, marketing, insurance, financial services and retail sales, communications, advertising, accounting, and customer relations. Andie earned a Bachelor's of Science in Mass Communications from Kansas State University and graduated from both the National Bank Trainer's School from Madison, Wisconsin and the Graduate School of Human Resource Management from the University of Colorado. Andie is a certified instructor in Frontline Leadership Training for Zenger Miller Inc., a nationally recognized leadership training company. She is also a certified facilitator in “Effective Leadership: Techniques for an Empowered Workforce,” a program of Development Dimensions International Inc. (DDI) for strategic professionals in talent management. Andie is extremely active in local leadership, educational, and philanthropic organizations. 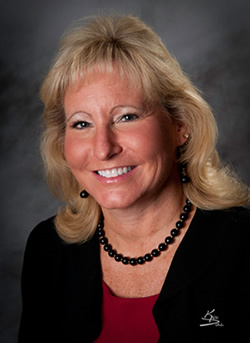 She is a current member of the Society for Human Resource Management (SHRM), past president and current member of Manhattan’s Human Resource Management Network (HRMN), Advisory Board member for Manhattan Technical College and Wamego Community Foundation, and serves as an Ambassador/Diplomat for the Manhattan Chamber of Commerce.